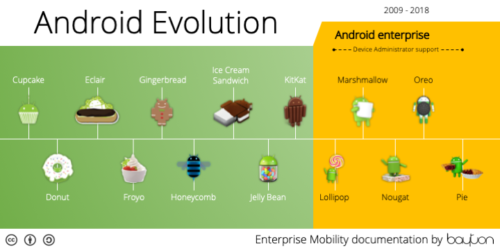 I’ve created two Android evolution graphics: one that simply includes all Android versions, the second that incorporates Android Enterprise. All examples I was able to find online were out of date. 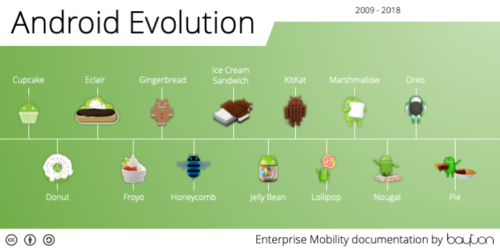 None incorporate Android Enterprise, which I believe is useful when presenting Android version history in an enterprise context. Please feel free to use them, modify them and re-distribute them. I only request you provide credit, and share your own PPTx for others to benefit in kind! If your documentation is public, I’d love to see what you’ve created! Tweet me @jasonbayton with the link. Future updates to this document will located on this page, feel free to come on back after the next version of Android launches!